With five days left for the launch of the much-hyped Metro services in the Capital, Delhi Transport Minister Ajay Maken today indicated that the state government would set up an integrated transport policy authority. The Government of NCT of Delhi today started emergency services by the Delhi Transport Corporation (DTC) to ferry commuters to and from airports and railway stations even as taxi drivers joined the strike called by autorickshaw operators. 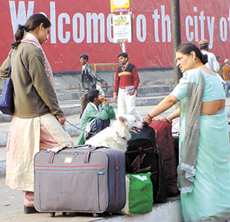 WAIT IN VAIN: With the taxi operators also joining the strike by autorickshaw drivers, the ‘welcome’ sign outside the New Delhi Railway Station belies what is in store for the visitors as this family wait endlessly for some mode of transport. Bollywood star Preity Zinta during the launch of PVR Star Club, India’s first loyalty programme for moviegoers, in the Capital on Thursday. 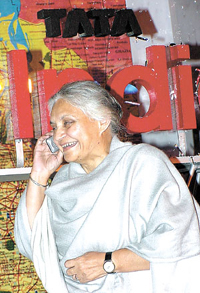 All EARS: Delhi Chief Minister Sheila Dikshit during The launch of Tata Teleservices in the Capital. The police today claimed to have arrested, Sachin Bidhuri, son of Ramvir Singh Bidhuri, a senior leader of the Lok Janshakti Party after a dramatic chase. Sachin had reportedly tried to run over a traffic police constable who signalled him to stop for talking on a mobile phone when driving. Members of Parliament representing the NCT of Delhi in the Lok Sabha and the Rajya Sabha fare no better than their counterparts elsewhere in the country in spending the money available to them under the Member of Parliament Local Area Development Scheme (MPLADS). Four members of a family, including an old couple, were killed and four injured on G T Road after the van in which they were travelling collided with an unknown vehicle near Chhoya bridge under the Babugarh police station in the wee hours of Wednesday. Sonekali, an unlettered mother of 22 children in Baiharipur Faruqabad village, is in the family way—once again—and all set to give birth to her 23rd child soon. The traders have finally agreed to pay trade tax after a meeting with the Bhiwani Municipal Council of Bhiwani members held on the council premises today. The council once again appealed to the traders to pay trade tax, licence and tehbazari fees. A junior engineer (JE) of the Dakshin Haryana Bijli Vitran Nigam (DHBVN) was arrested today by the Vigilance Department while accepting a bribe from a resident in Sector 21-B here. * The Capital city is one of the highest receivers of aid for charity and welfare functions despite the fact that states like Bihar, Uttar Pradesh and Orissa need more funds on account of the poverty in these states. A youth was injured seriously when he fell from a speeding train here last evening. According to a report, the youth, Suresh, was rushed to the local civil hospital. He was later shifted to a trauma centre in Delhi for further treatment. Defence Minister George Fernandes informed the Lok Sabha today a request had been received from the Haryana Government for opening of two sainik schools at Matenhail village in Jhajjar district and Palli Gothra village in Rewari district and a military school in Haryana in Devi Lal’s memory. A minor fire broke out at the All India Institute of Medical Sciences (AIIMS) this morning. There was no report of any damage to life or property. A man allegedly stabbed his maternal uncle to death over a loan of Rs 30,000 at a village in Dadri. The nephew, Shripal, along with his three accomplices, was nabbed within four hours of committing the murder, the police claimed. The Kandla-Bhatinda Pipeline of the Indian Oil Corporation (IOC) has bagged the prestigious Rajiv Gandhi National Quality Award for the Service Sector for the year 2001. Recognition and appreciation are awards in themselves. For the scores of women, particularly the underprivileged ones, who have scripted their success stories, the need for both recognition and appreciation is more of a motivation. Entrepreneurs from Punjab are more quality conscious than their Haryana counterparts if the number of ISO-9001 certifications is any indication. There are over 300 ISO-9001 certifications obtained by various industries in Punjab. The self-study report of Maharshi Dayanand University submitted to the National Assessment and Accreditation Council (NAAC) makes startling revelation of the hidden treasure in this university. One of the gems of this treasure is Prof Sarva Jit Singh of the Department of Mathematics. A camp was organised by the ‘Psy-circle’, a students’ organisation of the Department of Psychology, Maharshi Dayanand University, for psychological assessment of students at SRS Public School here today. The Additional District Judge, Mr Shiva Sharma, has on Wednesday dismissed with costs the appeal filed by Mr Manjeet against the orders of Ms Kanchan Nariala, Additional Civil Judge (Sr Division). Nature envelops us. Yet, how many times have we stopped in our tracks to experience it - the glory, the unexplained and the constant evolution? Some questions that can not be asked and some answers that cannot be given. The mysticism, divinity and constant evolution is all-encompassing. A new Punjabi album, ‘Do Gallaan’, by Balkar Sidhu from T-Series, has hit the market with foot tapping music. One of the songs ‘Saheliyaan’ has different variations of music and is likely to be a hit with music buffs. Another song ‘Chandrama’ is an energetic and romantic number. The organisers of the first Surajkund Tradefest at Surajkund tourist complex here have released the details of the cultural programmes to be held during the mela. Well-known Punjabi pop singer Jazzy B will present his songs on December 22. Sonik-Shahdara Football Club scored a 3-0 convincing victory against Garhwal Heroes in a crucial preliminary match of group-B to collect three points in the Delhi Soccer Association (DSA) Annual Open Clubs Senior Division Football League Championship played at Jawaharlal Nehru Stadium here today. The Haryana Cricket Association will complete the process of selecting teams for the 2002-2003 cricket session on December 22, when the selection trials take place for Haryana’s team for Board of Control for Cricket in India’s recognised under-25 cricket tourney. Superb batting by Gurav Chabra (84 runs) and deadly bowling by Vinay (3 for 30) helped Salwan boys beat Hansraj Model School by 102 runs and enter the semi-finals of the HT-Pace Milo Young Cricket 2003. The match was played at Amity ground. HUDCO defeated NTPC by 10 wickets in a super league match of Luminous Cup played at CSG II. Rajneesh Saxena of HUDCO was declared Man of the Match. Ekta Cricket Club beat Ravi Brothers by six runs in DDCA A-II division. Scores: Ekta Cricket Club: 260 in 40 overs (Azam Veer Nagar 87 n o, Pradeep Deswal 4/2). A fine knock of 85 runs by Saunik Chatterjee and a deadly bowling of 4/38 by leg spinner Sahil Chugh helped D L DAV School, Shalimar Bagh, defeat Ravindra Public School by 18 runs and enter the final of the first Aryavrat under-15 cricket tournament. Sar Group beat Hero Honda by 89 runs to enter the semi-finals of the 6th DG Phadkar Memorial Cricket Tournament at Teri Oval today.